TOUR DESCRIPTION: This is a specialized tour designed for adventurous guests looking to get off the beaten path and head to unique areas of the Park not normally visited on organized tours. 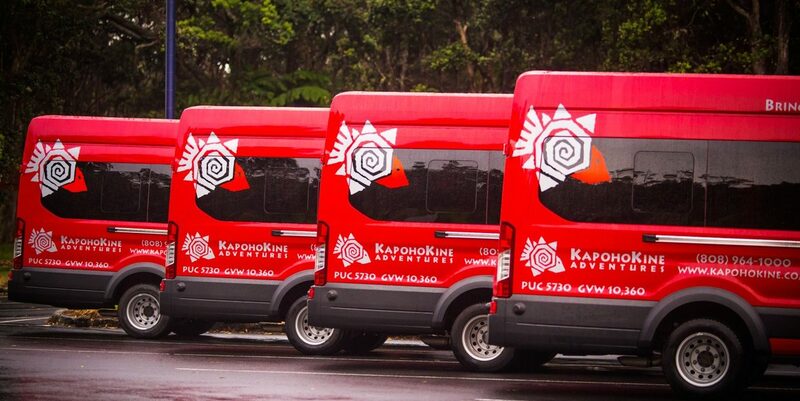 Starting at your resort in Kona, or Hilo, your guide will drive you to the Hawaii Volcanoes National Park. Start with a visit to the Kilauea Visitor's Center and a picnic-style lunch. Visit the Jaggar Museum, and then on to the Thurston Lava Tube. Hike down into the Kilauea Iki crater through the rainforest and across the still-steaming crater floor. This 4-mile hike culminates with a walk through the Thurston Lava Tube. Next, you’ll visit the famous Volcano House, a landmark which inspired literary giants such as Mark Twain and Jack London. Enjoy a delicious dinner while marveling at Kilauea Volcano erupting in the distance. End your adventure with a stop at the Halemaumau Crater to view the lava glow under a silky canape of stars. Red molten lava may not be seen and cannot be guaranteed as volcanic activity changes constantly. Order of itinerary may change. What to Bring: Video and/or still cameras, government issued ID. Restrictions: All guests (including children) should be able to negotiate a strenuous 4-mile hike, unassisted, which includes a high number of steep uphill and downhill sections. Guests with small children are responsible for providing their own child carriers to safely navigate the entire hike. State law requires child safety seats for all guests under 4 years of age (we're happy to supply seats at no charge with advance notice). Booster seats required for all guests between ages 4 and 7 and under 4 feet 9 inches tall and 80 pounds weight (we're happy to supply seats at no charge with advanced notice). Guests under the age of 18 MUST be accompanied by an adult. Volcanic emissions, including sulfur gas, may affect those with respiratory concerns. Participants should be prepared for immediate evacuation in accordance with directions given by County, State and/or Federal officials. Italian Cold Cut - Italian ham and Genoa salami, provolone cheese, fresh tomatoes, lettuce, dill pickle, Maui onions, topped with olive oil dressing, black pepper, on an Italian style roll with garlic, basil and oregano seasoning. Salads offered using same ingredients. Volcano House Dinner Menu at THE RIM: Grilled Herb Chicken served with garlic mashed potatoes, sautéed local kale from Johnson Farms, and a lemon macadamia nut butter sauce. Coconut Encrusted MahiMahi: Served with jasmine rice, stir fried bok choy, and a ginger mango sauce. Island Tofu Vegetable Stir Fry served with coconut jasmine rice and fresh pineapple. Tour amenities: Umbrellas, lunch, snacks and beverages are also included throughout the day. This tour is an exclusive tour and only accommodates up to 12 people Per departure. Don't forget to also bring along your camera to capture the day!